Responding to this history, Rhoades has built pleather video-sculptures, which take viewers on a fantastical trip through the 17,000 years of humanity’s sometimes mystical and sometimes brutal relationship with cattle. 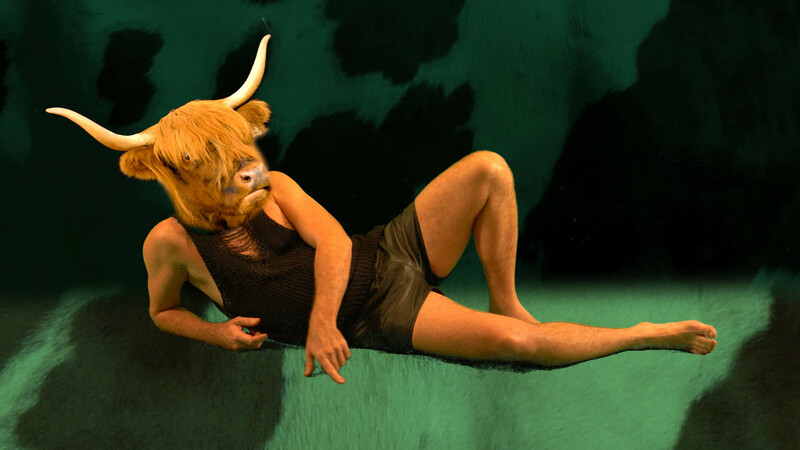 One of the videos includes a titillating rendition of the Ancient Greek myth of the Minotaur – played by celebrated actor and Taurus, Kevin Clarke. Informed by both gay culture and bovine symbolism, Rhoades queers the species divide and reflects on the history of subjugation and abjection that animals, queer humans, and human-animal hybrids have shared.